Looking for something different? I'm happy to offer bespoke jewellery, just get in touch with the details. 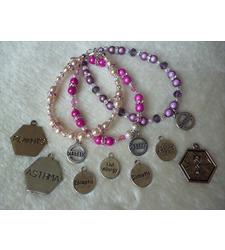 I have lettered beads to produce bracelets with names of other medical conditions eg epilepsy or an allergy. Bespoke bracelets available with your choice of beading, charms and colour. Choose a length and style and I'll make a bracelet to your order. Use my Contact Us page or email kirsty@diabeticjewellery.co.uk with your request.Medical charms available: Diabetic, Nut Allergy, Asthma, Angina, Epileptic When your bracelet is made, it'll be added to this page for you to be able to purchase the item using Paypal.